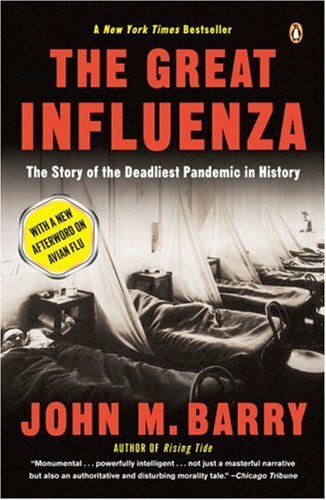 When the 2009 H1N1 pandemic influenza virus emerged earlier this year, I began re-reading John Barry’s The Great Influenza. I came across the sentences that I had underlined during my first read identifying errors in basic virology. Because this is a very popular book, it’s important to identify the mistakes and correct them. Barry is not a virologist, or any type of scientist. He’s a historian who happens to have written on influenza. This does not excuse the virological errors in his book; he should have had a virologist fact-check the manuscript before publication. Page citations refer to the Penguin Books paperbound version. This sentence implies that the reproductive cycle of every virus includes integration of the genome into that of the host. Barry’s statement is incorrect; only genomes of certain viruses (e.g. retroviruses) are introduced into the host DNA. Only some viruses enter the cell from the ‘pit’ formed at the plasma membrane. In many cases the ‘pit’ eventually becomes a vesicle known as an endosome which moves deep into the cytoplasm. Influenza viruses enter cells from endosomes. I presume Barry is referring to the ability of influenza NA to remove sialic acids from the cell surface, thereby liberating surface-bound virions. Other viruses have this ability. Viruses that do not possess a neuraminidase probably have other ways to leave the cell surface, such as a weak virus-receptor interaction. Cleavage of the HA does not occur during endosomal entry. Whether or not the viral HA is cleaved (which is required for infectivity) is determined during assembly of the virus particle. The influenza virus genome does not integrate into the DNA of the host cell, as noted above. Members of other virus families do have neuraminidases which probably serve similar functions during infection as the influenza NA. It’s not correct to write that ‘few’ viruses do anything similar. A single antibody does not have the ability to bind thousands of antigens; only one. Collectively, antibodies can recognize thousands of epitopes. Dendritic cells don’t engulf viruses and bacteria – they take up extracellular proteins by endocytosis, then display them to lymphocytes. Perhaps Barry is thinking of phagocytic cells such as macrophages. The mutation rate of all influenza virus RNA segments is similar. What Barry means is that the HA and NA proteins vary more than do other viral proteins. This is because the HA and NA are structurally plastic and can accommodate amino acid substitutions. Changes in the protein are not mutations; this term refers specifically to nucleic acid. These conclusions simply are not correct. I discussed this issue previously. One of the problems with The Great Influenza is that statements such as this one are not supported by literature references. There has been so little person to person spread of ebolavirus that this conclusion cannot be made. As I’ve written before, we have no evidence for an increase or decrease of the 1918 virus with time, because there are no virus isolates other than one reconstructed from November 1918. All these statements are therefore without any proof and remain highly speculative. It’s not my intent to severely criticize the book – it’s a compelling description of a very serious pandemic. I simply want to ensure that everyone understands the scientific underpinnings of the outbreak. When authors write about science for a general audience, they have an obligation to get the science right. I'd give him a pass on this one. DCs in peripheral tissues (often called “immature” DC, which is a poor name) are quite phagocytic. They lose some of this as they traffic to the secondary lymphoid tissues, but they continue to present the peripherally-phagocytosed antigens. The question of phagocytosing viruses is a little more confusing, and gets more into terminology, I think. The notion that viruses all integrate into the host genome is really widespread — I assume that it's because for many people HIV is the most important virus and the first, or only, one they learn about, so they assume this very unusual lifestyle is the most common one. gsgs, please look at: http://www.google.com/hostednews/canadianpress/…. Quoting the article: “Unproven assumptions about the course of the 1918 Spanish flu pandemic may be leading to misperceptions of what the swine flu virus has in store for the world, the scientist who decoded the genetic blueprint of the 1918 virus suggests in a newly published commentary. Virologist Dr. Jeffery Taubenberger, along with co-author and medical historian Dr. David Morens, argues there is no firm evidence that the 1918 virus ratchetted up in virulence in a fall wave – because there is no solid proof outbreaks of illness in the U.S. in the spring of 1918 were caused by the same virus. The samples you cited are all from the Fall wave. The British do have a sample from early in the third (Spring 1919) wave, which is from a woman who died in February 1919, in London. This sample was sequenced and determined to be very similar to the US samples taken from the Fall wave. None-the-less, no one seems to be able to find a sample from the first (Spring 1918) wave. In the US, this first wave hit three military camps (1 in Kansas and 2 in Georgia) very hard, but few people died of the disease. Perhaps no one thought to keep a sample. On the other hand perhaps there are one or two samples out there and no one has been able to find them, or just that no one has looked, assuming that they are not there in the first place (always a bad assumption). independent pandemics in the same year ? yet, publish a revised edition with correct science. I agree that Barry should respond here, and emailed him this evening to say so. I hope he turns up here with his arguments in hand. just from the managing software-design. Let's just copy what he wrote, no problem. I'm John Barry and plan to post a more detailed reply in the future– if anyone still cares. However, let me respond briefly here. First, I certainly know the difference between a retrovirus and other viruses, and I thank my critic for pointing out the imprecision of my language. In future printings of the book, this will be corrected. Any other factual error will also be corrected. But most of his comments reflect either errors on his part– such as on dendritic cells, some of which although not all do do what the book says they do– willful misreading of the book, overkill on the interpretation of relative statement (such as just what “a few” means), or matters of opinion. I will limit my response now to the most important point he raises– since it's the only one that is relevant to our present predicament. He disputes my hypothesis that the H1N1 of 1918 changed virulence from spring to fall. He mentions Taubenberger's recent article in this regard. My critic's chief complaint seems to be that there's no molecular evidence that the spring and fall waves were caused by the same virus. But since the first wave was generally so mild, and killed so few– the British Grand Fleet, which patrolled the coast of Europe, saw 10,313 cases but suffered only 4 deaths– it's unlikely we'll ever get enough molecular evidence to prove or disprove this opinion. Nonetheless, he seems to feel that only molecular evidence matters. The reality is even molecular evidence would not be conclusive. If we had a sample from the spring and it was the same H1N1 virus as the fall, all that would prove was that the fall virus did circulate in the spring. It would not prove that the fall virus caused the spring wave. Similarly, if the spring sample was not H1N1, that would only prove that that single sample was not. We would expect a new pandemic virus to co-circulate with the old virus initially. How many samples would it take to prove things one way or another? More than we are likely ever to get. I think the evidence is very strong that the spring wave in 1918 was caused by the same virus as the second wave, and hence that virulence did change. This evidence is epidemiological, but it is in my opinion compelling. There is no doubt a new pandemic virus erupted in the spring, long before “late June” when Taubenberger's article is willing concede that a pandemic began. In fact, the pandemic picked up its name “Spanish Influenza” when it struck Spain– in May, before Taubenberger agrees that a pandemic existed. There were many contemporaneous journal articles about the spring wave published in the literature all over the world. So there are two possibilites. Either one pandemic virus was supplanted by another, or the same virus caused both waves. The first hypothesis is possible, and many people now fear that H1N1 could be supplanted by an H5N1 pandemc (or by a reassortant of H1 and H5, or another reassortant, or by an entirely different virus). But this seems quite unlikely. More importantly, there is overwhelming evidence that spring wave exposure provided protection against the lethal wave. This protection was much greater than can be explained by the cross-protection that one strain might provide another. In fact it was equal to or better than a good modern vaccine. A modern vaccine is considered decent at 70% effectiveness, and a few years ago the vaccine was only 44% effetcive. Spring exposure protected against the fall wave often with 80-90% effectiveness. I wrote about this at length. See: Barry, JM, Viboud, C, Simonsen, L,, Cross Protection Between Successive Waves of the 1918-19 Influenza Pandemic: Epidemiological Evidence from US Army Camps and Britain, J Infect Dis. 2008 Nov 15;198(10):1427-34. I wrote that article hoping to convince those who speculated that the waves were caused by different viruses that they were wrong. Apparently I was unsuccessful in this. Those who argue the virus did not change virulence in 1918 are not being logical. They're being tautological. They are saying that influenza viruses don't change virulence; waves in 1918 were of different virulence; therefore the viruses were different. There are other puzzling instances besides 1918 that suggest the influenza virus has changed. Going backwards in time: In 1968, for example, 70% of the mortality in the US occurred in 1968-69, and 30% occurred in 1969-70. In Europe it was the precise opposite. (Viboud, et al, Multinational Impact of the 1968 Influenza Pandemic: Evidence for a Smoldering Pandemic, Jour. Inf. Dis., 2005:192 (15 July), 233-248.) There are speculative explanations of such an occurrence that do not include changes in the virus, but a change in the virus has to be a possible explanation. All are speculative. And in 1957 CDC (CDC had a different name then but the same initials) investigators speculated that the virus “had increased in virulence” to account for mortality in 1958 despite less morbidity (Trotter, Yates, et al, Asian Influenza in the United States, 1957-58, Am. Jour. Hygiene, 1959, vol 70, 34-50). And the 1889 pandemic began in May of that year, but it was not truly pandemic. A contemporary invetsigator wrote, “In 1890 the influenza outbreaks were as a rule single or isolated and occurred in only a few places in Europe, particularly in Lisbon, Nuremberg, Paris, Copenhagen, London, etc.” And a different investigator said it was not for two more years before, “The third real epidemic spread of influenza was a true pandemic which began in October 1891 and lasted through the whole winter until the spring of 1892.” (WT Vaughan, Influenza, 1921, 45-46.) It's not clear if it increased in virulence (though the third wave was the worst), but it certainly seems to have increased its ability to infect people. Did the 1918 virus increase in virulence? We will never know with certainty. But until H5N1 surfaced, most people did not believe influenza could jump directly from birds to people either. First, I certainly know the difference between a retrovirus and other viruses. In fact, nearly 20 years ago I co-authored a book with Steve Rosenberg, who while best known for his work pioneering immunotherapy for cancer also participated in the first sanctioned gene therapy experiments, and he used a retrovirus as a vector to insert the therapeutic gene into the genome. I was present as an observer at some of those experiments. I thank my critic for pointing out the imprecision of my language. In future printings of the book, this will be corrected. Any other factual error will also be corrected. But most of his comments reflect either errors on his part– such as on dendritic cells, some of which (although not all) do do what the book says they do– willful misreading of the book, overkill on the interpretation of relative statement (such as just what “a few” means), or matters of opinion. I will limit my response now to the most important point he raises– since it's the only one that is relevant to our present predicament. He disputes my hypothesis that the H1N1 of 1918 changed virulence from spring to fall. He starts out by attacking my comments on passage. The point the book makes about passage is absolutely accurate. When an organism enters a new environment, it adapts. As the book says, sometimes an organism increases virulence, sometimes it decreases. Sometimes other aspects change. The polio virus investigators worked with was grown in nerve tissue so long in the lab, people believed it would only grow in nerve tissue. Several investigators even proved that was the case– and it was the case for the lab virus, which through passage had lost abilities that wild virus had. Enders won a Nobel Prize because he did not believe that proof. Back to whether influenza changed virulence in 1918: My critic mentions Taubenberger's recent article in this regard, suggesting that it did not. My critic's and Taubenberger's chief complaint seems to be that there's no molecular evidence that the spring and fall waves were caused by the same virus. But since the first wave was generally so mild, and killed so few– the British Grand Fleet, which patrolled the coast of Europe, saw 10,313 cases but suffered only 4 deaths– it's unlikely we'll ever get enough molecular evidence to prove or disprove this opinion. Nonetheless, he seems to feel that only molecular evidence matters. Yet the reality is even molecular evidence would not be conclusive. If we had a sample from the spring and it was the same H1N1 virus as the fall, all that would prove was that the fall virus did circulate in the spring. It would not prove that the fall virus caused the spring wave. Similarly, if the spring sample was not H1N1, that would only prove that that single sample was not. We would expect a new pandemic virus to co-circulate with the old virus initially. How many samples would it take to prove things one way or another? More than we are likely ever to get. In July 2002 in Madagascar, influenza suddenly attacked several provinces; morbidity reached as high as 70% in some towns and a death toll suggestive of 1918. (many references, see for example MMWR, November 15, 2002 / 51(45);1016-1018.) World Health Organization experts, worried that it was a new pandemic virus, immediately investigated. It was not a new pandemic virus. It turned out to be ordinary seasonal influenza, H3N2/1999/panama, which soon returned to its ordinary ways after affecting only 11 of 113 health districts in Madagascar. Coming 34 years after H3N2 started circulating, there is no adequate explanation for this.Some have argued this region was particularly stressed by civil war and malnourishment, but much of the world is under such stresses and no similar influenza outbreaks ahve been noted. So regular seasonal influenza has shown the ability to fire lethal bursts. In the 1968 pandemic, 70% of the mortality in the US occurred in 1968-69, and 30% occurred in 1969-70. In Europe it was the precise opposite. (Viboud, et al, Multinational Impact of the 1968 Influenza Pandemic: Evidence for a Smoldering Pandemic, Jour. Inf. Dis., 2005:192 (15 July), 233-248.) There are speculative explanations of such an occurrence that do not include changes in the virus, but a change in the virus has to be a possible explanation. All are speculative. And in 1957 CDC (CDC had a different name then but the same initials) investigators speculated that the virus “had increased in virulence” to account for mortality in 1958 despite less morbidity (Trotter, Yates, et al, Asian Influenza in the United States, 1957-58, Am. Jour. Hygiene, 1959, vol 70, 34-50). And the 1889 pandemic began in May of that year, but it was not truly pandemic. A contemporary invetsigator wrote, “In 1890 the influenza outbreaks were as a rule single or isolated and occurred in only a few places in Europe, particularly in Lisbon, Nuremberg, Paris, Copenhagen, London, etc.” And a different investigator said it was not for two more years before, “The third real epidemic spread of influenza was a true pandemic which began in October 1891 and lasted through the whole winter until the spring of 1892.” (WT Vaughan, Influenza, 1921, 45-46.) It's not clear if it increased in virulence (though the third wave was the worst), but it certainly seems to have increased its ability to infect people. Please remember this is a popular science book, descriptions of virus particle fusion and entry, budding etc. may not live up to the exact nature of reality, and to be completely true we scientist don't necessarily understand all the nuances of these processes. Additionally, dendritic cells are phagocytic to some degree. for everyone but in a correct manner. So Barry believes viruses are organisms. Interesting or have I misinterpreted something. In addition, as a person intersted in the Philosphy of Science and Bioethics, it may be safer to say that only living organisms may adapt to changing environment via genetic mutation but non-living obligatory intracellular parasites (i.e. viruses) which are incapable of independent survival simply may evolve-not adapt. Even a virus' genetic mutation can be only due to the host's biology. Perfect reasons why this is a horistorian’s view back to 1918 and not a virologists. I’m sure if a virologists worked a Historian they could write a informative and popular book on The Great Influenza too.